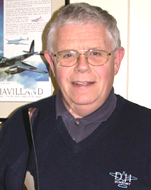 Bill and his de Havilland Support co-owner, Mark Miller, approached Brian when faced with a dramatic change in their business’s funding model, which questioned its survival. Brian helped to put together a new Business Plan with a new funding model which also led to the grant of a transition fee to assist during the implementation of the new strategy. This allowed Bill, Mark and their team to continue offering their firm’s valuable service to the historic aircraft fleet with planes such as the Tiger Moth, Dragon Rapide, Bulldog and Chipmunk.